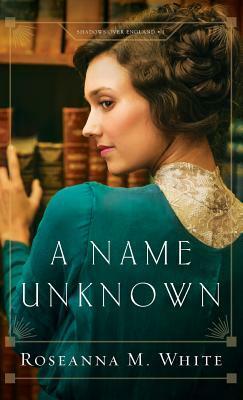 I was a little wary of reading A Name Unknown because I get rather frustrated with the cheesy, unrealistic nature of a lot of historical fiction novels (and most especially Christian historical fiction novels). I really liked the premise, though, so I decided to take the plunge and review it. And I'm very glad I did. While the writing was indeed slightly cheesy in parts (mainly in the few–rather skippable–scenes where the characters were talking/writing about religion), I was impressed by how normal A Name Unknown really was. I didn't read it thinking "ick, this is cringe-worthy but it's fluffy enough that I'm enjoying it;" rather, I was so engaged by the story and its characters that I wasn't really thinking anything to myself at all. I believe I can unequivocally say that A Name Unknown is not only the best Christian fiction novel I've read in a very long time, but it's also straight-up one of the best romances I've read in a while. I think a huge reason for this is the male lead. Most books feature male protagonists who are handsome and brooding, rich and intelligent, well-spoken and clever. Peter Holstein is many of these things–he's middlingly handsome, quite wealthy, very smart, and extremely clever–but all of this is hidden from the world by his terrible stutter. That's right, Peter has a stutter. Like, a really bad one. And I love that, because it makes him so much more real and vulnerable. I mean, the man communicates important things to people by letters because he can't make his tongue trip out all the right words! Peter is also definitely not some high-society golden boy: he's basically scorned by everyone but a close few, because his family and last name tie him too closely to the hated Germans (the book's set during the lead-up to WWI, a fascinating time I know far too little about). I also love that we get to watch Peter and Rosemary develop a very natural relationship over the course of over 400 pages–there's zero insta-love involved. They don't look at each other for the first time and get a strange spike in their heartbeat, they don't find themselves yearning to be close to each other, they don't rush to fall in love with someone they just met because they're physically attracted to them. During the first half of the book their relationship grows carefully, slowly, respectably, and genuinely. It's a beautiful thing to watch. Now for a few negatives. I have to say, A Name Unknown does fall for the usual trap of having the characters start saying stupid, unrealistic things after things have developed a bit: Rosemary and Peter express their high opinions of each other in terms that are way too frank, for example. The only other bad dialogue comes in once or twice when Rosemary is supposed to be showing off her street smarts and cleverness–her dialogue in those scenes reads more like something from a movie than anything from real life. Come to think of it, Peter was a little too perfect as well. But I'm really not complaining too loudly. He's a sweet, humble bookworm, for crying out loud. A bookworm and an author. And they grow to know each other by reading books and talking about them, which is like my ideal romance. So I'm just going to make a passing reference to the political stuff that I've completely ignored (and which was actually quite fascinating, by the way!) and end the review here. Disclaimer: I received a complimentary copy of this book from the publisher in exchange for an honest review.